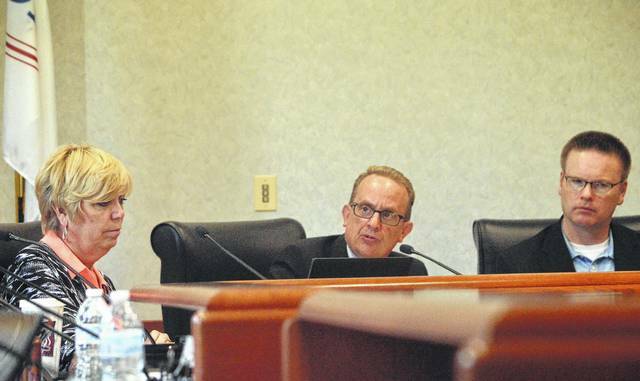 Delaware City Manager R. Thomas Homan, center, discusses a resolution to oppose a portion of the Trump administration’s budget for the fiscal year 2018. Delaware City Council has passed a resolution opposing a portion of the Trump administration’s federal budget proposal. Council voted 6-1 on the measure in response to the proposed budget’s cuts to the Community Development Block Grants and the HOME Investment Partnership program funding for fiscal year 2018. City Manager R. Thomas Homan and Community Development and Planning Director David Efland oppose the cuts, but believe the proposal is unlikely to survive Congressional review of the budget. “I think it’s important that we let our U.S. senators and our congressman know what our position is,” Homan said. The state has provided an annual CDBG grant allocation of about $80,000 per year to the city. But it has already taken preemptive action to instead allocate CDBG funds once every two years, meaning the city would not receive funding for the 2018 construction season, but would receive funds for the 2019 season. Over the last decade, the City of Delaware has received more than a million dollars in CDBG funding and put it to use for projects and programs such as street repaving, sidewalk, curb, and bike path improvements, downtown revitalization, a roof for the Liberty Community Center, demolition of blighted properties, rental assistance, and construction of four Habitat for Humanity homes. “If there were less red tape involved for both the state and federal government that would not make me displeased,” Efland said. Councilman George Hellinger made the motion to approve the resolution with Councilman Chris Jones, 1st Ward, providing the second. Both voted yes. Delaware Mayor Carolyn Kay Riggle, who’s been involved with some of the Habitat for Humanity projects, voted in favor of the resolution. “I’m just thankful that we have it and I really hate to see it go away,” she said. Councilman Kyle Rohrer, 4th Ward, cast the dissenting vote. He told The Gazette he did not view the resolution as an appropriate way to express an opinion. • established a public hearing at 7:30 p.m. on July 24 if it receives an application by July 7 to have a designated outdoor refreshment area in downtown. The DORA would allow downtown patrons to walk within a specified area while drinking an alcoholic beverage. Council discussed earlier this month about when the DORA would become active. • approved a resolution to allow the city manager to negotiate an incentive package with COHatch to establish a co-working space in downtown Delaware. Potential locations include the former Gazette and the Brooklyn Heights buildings, both located on William Street near its intersection with Sandusky Street. • canceled the July 10 council meeting.